More juicing for detox! Cleansing your beautiful body is the perfect way to start off the new year, in my opinion. I'm going to do a juice fast, starting this afternoon. (This juice recipe is from yesterday afternoon after I worked out.) I would start right away today but I'm staying at my boyfriends and he is not fortunate enough to have a juicer. Sad face. Anyone who wants to join me is totally welcome! It'll probably last about 5 to 10 days and I will be posting frequently on the blog (here) and facebook. Even if you're eating 100% raw (or whatever you consider to be the most optimal diet for you), exercising daily and all that other good stuff, it is never a bad idea to do a juice cleanse - I use the words "fast" and "cleanse" interchangeably by the way - because you are not necessarily restricting your calories so you won't be starving or malnourished. In fact, on a juice fast you will most likely be enjoying the most nutritious diet ever because - like I just said - you're getting adequate calories, but you are also receiving the highest quality, most nutrient-dense and high water content foods on the planet that are ridiculously easy to absorb and digest. Fresh juice is delicious and can save lives. It has already. The juice I made today was to give my skin a boost in health and colour. Winter does a number on my skin and hair because both are pretty sensitive. 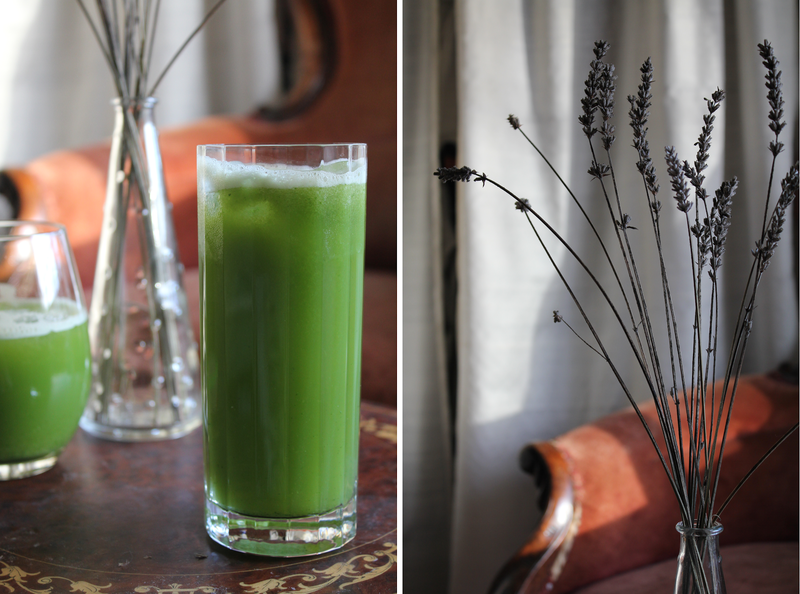 Cucumber is excellent for your skin, as is celery and they are both included in this recipe. Want glowing skin? Drink cucumber juice. That is absolutely perfect! I feel like this fast will be about 5-10 days so we're both in complete synchronicity. Wow, this looks wonderful! I'm actually working on transitioning to being fully raw right now, so that's my cleanse of sorts for the new year (doing the low-fat 80/10/10 version). But next time I juice fast, I'm coming back to these recipes! Happy new year! Love your pictures of this juice! Very creative and certainly delicious. Drinking this now! :) (Except I had to use red apples instead of green!) 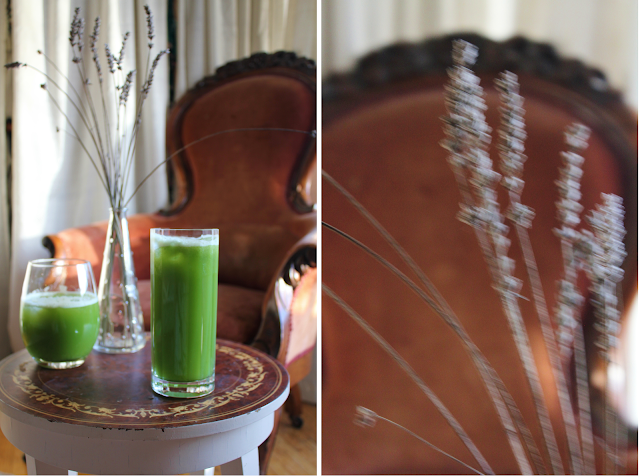 It's so delicious, I think this will be my new go-to green juice. Thank you for your inspiration!! Also I've been thinking of making juices in the morning and putting them in a glass bottle and having one in my bag throughout the day. Does this work very well with home made juices? Hey, how does one go about doing a juice fast? I've done some fruit cleanses in the past, but I like trying new things. What's a good regime for a juice fast? Omega 350 VRT - love it! I wanted to do a two day juice detox for my skin. Do you have any suggestions? Great recipe! Usually I don't like greens in my juices. I know, they are very healthy and good, but I haven't found a great green recipe that I like. Here something different. Your juice seems very yummy and healthy. Only from photos I already want to do it. Hi Emily, I've been making your roast vegies with green soba noodles for lunch recently, amongst of other desserts and smoothies - they are absolutely divine! Thank you so much! Do you think you could make this juice with a vitamix instead - don't have a juicer :(. What kind of juicer would you recommend getting? Been thinking about doing this for ages! @Anonymous - I have an Omega VRT 350 and I love it. I recommend it, but if you don't wanna pay $300 or whatever it costs, there are cheaper ones. Apparently the Breville juicer is good! Can I juice the night before and how long will it keep its potency? I am beginning a 10 day fast and looking to get some glowing skin back?